One of my all-time favorite seasonings for fall is chai spice – similar to the flavorings used in apple or pumpkin pie, it is a rich mix of cinnamon, cloves, and ginger, with the added zing of allspice and cardamom. A spiced chai latte or iced chai with milk are perfect companions to a crisp fall day spent amongst the colorful leaves. This weekend, however, I decided to use some chai spice in a more creative way: to jazz up my typical Sunday morning french toast! This recipe also makes use of all those fall apples you might have lying around, and will fill your kitchen with a phenomenal combination of autumn aromas. Whisk the eggs, milk, vanilla, chai spice and a pinch of ground cinnamon in a 9-by-13-inch baking dish. Add the bread in a single layer, turning until all the egg is absorbed. Meanwhile, heat a large skillet over medium heat, melt 1 tablespoon butter, and add apples and 1/2 teaspoon cinnamon, stirring to coat until starting to caramelize. Add the water, cooking until water has evaporated and apples are tender, about 4 minutes. Pour in the maple syrup; simmer for a minute to combine. In a large, heated nonstick skillet or griddle (I like to spray mine with cooking spray to further prevent sticking), saute the soaked bread until golden brown on each side, about 4 minutes. 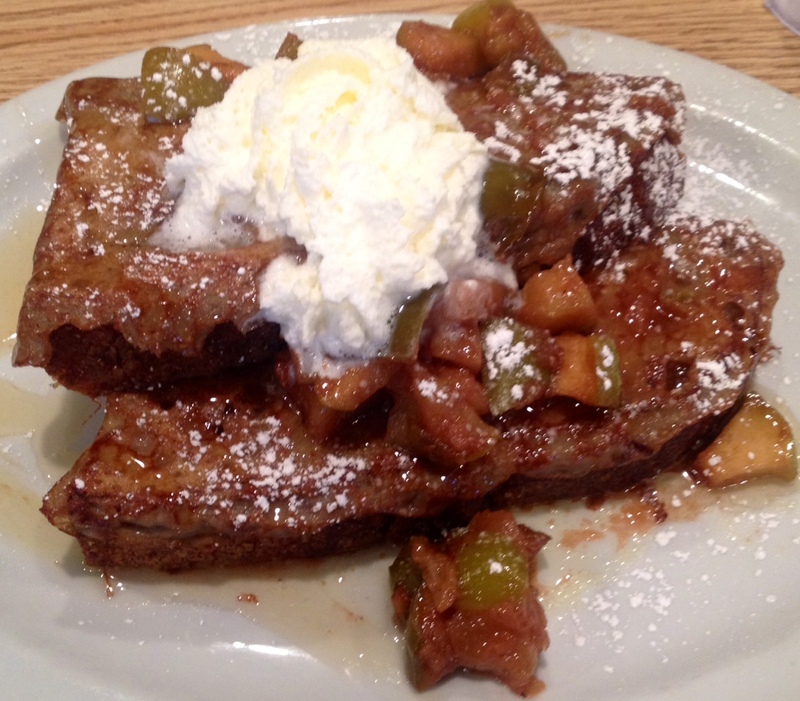 Place French toast on a plate and top with apple-maple mixture, plus whipped cream and/or powdered sugar if you’d like! Posted on October 22, 2014 by Jilly G	• This entry was posted in Recipes and tagged apple, breakfast, brunch, cinnamon, fall, french toast. Bookmark the permalink.